Equipped with frost-free technology and a range of storage options, this Hoover fridge freezer is ideal for every home. Exclusive to Euronics and Agent stores, you won’t find the HVBF5172WHK anywhere else. The shelves are adjustable to fit around different items, while the salad bins will keep your vegetables fresh and crisp. 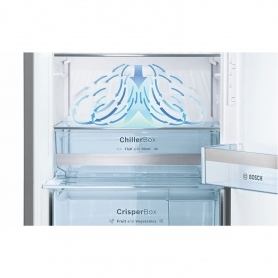 Plus, the fridge’s antibacterial lining helps to keep your appliance more hygienic. In the 65 litre net capacity freezer, there are four clear drawers, one of which is larger to suit bulkier items. You’ll even find an included ice cube tray – perfect for cooling down drinks on hot summer days. And, as the freezer has a four-star rating, you can store food in temperatures as low as -18°C, over a period of 12 months. You’ll also enjoy the superb frost-free technology, which prevents ice from building-up inside the HVBF5172WHK. Finally, you can say goodbye to the days of manually defrosting your fridge freezer. Awarded an ‘A+’ for energy efficiency, Hoover’s HVBF5172WHK is kinder on the environment and your pocket. You can also take advantage of the bright, energy efficient LED, consuming 15 times less electricity than standard bulbs. And, producing a noise level of just 43 dB, you won’t even notice your fridge freezer running. Offering a 10 hour storage period without power, you can rest easy that your food will be safe in the event of a power cut. 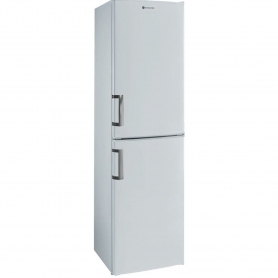 Plus, the white gloss reversible doors allow the fridge freezer to work around your room’s design. Hoover has created the ideal family fridge freezer. Equipped with a range of useful features, it’s a must-have for every home. Buy the HVBF5172WHK today.